Primacy is available in single and dual-sided versions and is the ideal choice for printing and encoding cards in medium and large runs. Using advanced encoding technologies, this desktop printer is the best solution for issuing personalized cards, from the most simple to the most secure. Multiple options – some option combinations not available. Want to protect your investment? Learn More! Higgins provides exceptional service on our diversified product line. We offer many types of service contracts and warranty upgrades on all of our products. The benefits include: preventive maintenance and cleanings, priority service with a four-hour response time, loaner equipment, supplying and installing required parts when needed, and more! Every service contract is personally designed and priced to cater to your equipment needs and budget. Interested? Primacy is perfect for printing large runs because it personalizes color cards in record time: up to 225 cards per hour for single-sided printing and 140 cards per hour for dual-sided. You save time and increase productivity. Primacy printers feature 300 dpi photographic resolution and edge to edge printing for optimum print quality. Your cards convey a professional image of your organization. The card feeder and output tray are directly accessible on the front of the printer, so you can check the cards as they come out. The large capacity card feeder and output tray hold 100 cards – so you don’t have to refill the printer as often. Primacy offers high capacity in a compact footprint. You can upgrade your printer according to your needs by adding magnetic stripe, contact or contactless chip encoders. The printer can be factory configured for dual sided printing, or the function can be activated on site. 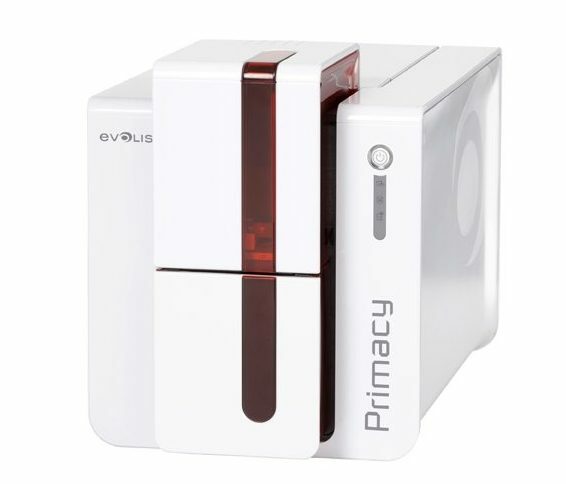 Primacy benefits from Evolis’ experience and proven quality control to ensure optimum performance and perfect results. We back up our strong commitment to quality with our 3-year standard warranty.